DisplayScrollBars Application Property in VBA is used to either stop or display the scroll bar for all workbooks. It has Boolean value either True or False. If the value is Tue, it displays the scroll bar for all workbooks. If the value is False, it stops display the scroll bar for all workbooks. 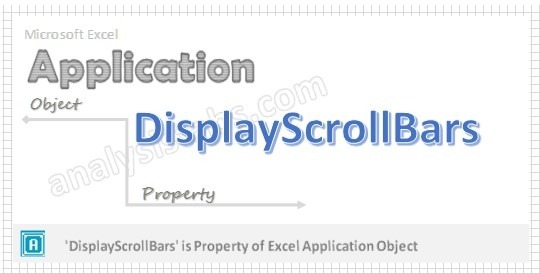 Please find the syntax and examples on DisplayScrollBars property of application object in the following section. Here syntax for DisplayScrollBars Property of application object in VBA. In the above syntax Application represents object and DisplayScrollBars is the Property of Application object. Please find the below example for DisplayScrollBars Property of application object in excel VBA. The below example doesn’t displays the scrollbar for all workbooks. Please find the below example for DisplayScrollBars Property of application object in excel VBA. The below example displays the scrollbar for all workbooks. Step 6: Notice the above macro results on the Worksheet for better understand.